The senior RSS/BJP ideologues lately have been hailing UP chief minister, Mahant Yogi Adityanath as sanyasi(Hindu ascetics) of novel Anandmath (Abbey of Bliss) penned by Bankim Chander Chatterjee (1838-94)[i]. Anandmath, novel written by Bankim in Bengali, was the first most important work outlining the concept of a Hindu Rashtra. Anandmath is the Bible even today for the believer in the concept of a Hindu nation. Before familiarizing with the contents of this novel, it will be appropriate to know few important facts about the novel and its author. This is the same novel in which Bankim presented the song Vande Mataram which equated nationalism to mother-worship. Anandmath is basically the story of the Hindu sanyasi rebellion of the late eighteenth century in North Bengal of India against rule of the Muslim nabobs. These rebels called themselves Santans (children). This novel appeared in 1882–5, about 25 years after the defeat of the Indians in the Great War of Independence of 1857, when even the ceremonial authority of the Muslim rulers was gone. It is to be noted that the British rulers held mainly Muslims responsible for the 1857 ‘Mutiny’ and consequently penalized them heavily. Anandmath appeared when British sovereignty had been formally established over a large part of India. It will be interesting to note that this novel touted as the greatest tome of the Hindu nationalism did not get much attention for almost 25 years after its publication in Bengali. It became popular after the Partition of Bengal (1905) with its translation into English. It prepared ground for the rise of Hindu and Muslims variants of nationalism. When RSS/BJP equates Adityanath with sanyasis of Sanatan Sena of 18th century they do it consciously and well aware of the fact that these sanyasis led a violent campaign to cleanse Muslims from Bengal. Interestingly, Anandmathnot only preached cleansing of Muslims but also welcomed and hailed the subjugation of Indian by the British rulers. In order to understand the debased, inhuman and anti-national content of this novel, some of the relevant portions are being directly produced below. It may be noted here that many of these gruesome acts of violence against Muslims are re-enacted as games in training sessions of Hindutva organizations. The methods of massacre of Muslims during pre and post Babri mosque demolition in 1992 and 2002 Gujarat carnage showed clear imprint of techniques of Anandmath. The two fundamental traits of Anandmath; violent opposition to Islam/Muslims and kow-towing to the White masters remained the fundamental pillars of the Hindu nationalism. These were clearly visible in the writings and deeds of Hindutva stalwarts like VD Savarkar, KB Hedgewar, BS Moonje and MS Golwalkar. 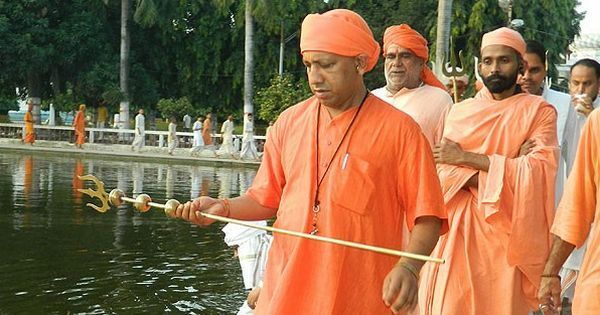 Adityanath’s depiction as sanyasi of Anandmath by the Hindutva brigade is reaffirmation of the fact that fundamental agenda of the RSS/BJP remains the same; cleansing of Muslims from India. It is unfortunate that a novel which played prominent role in fracturing the united freedom struggle against the British rulers, is being resurrected. The UP victory of RSS/BJP (securing only 39.7% of the polled votes) is being celebrated as the victory of Santan Sena over Muslims in Anandmath. India seems to be standing at a cross-road; to continue on the path of a democratic-secular polity or embark on the path of Anandmathis the greatest challenge after Independence.It is hoped that an all-inclusive India will not let RSS/BJP succeed in its nefarious goal of letting ghosts of sanyasis of Anandmathto undo present India. [ii] Chatterjee, Bhabatosh (ed. ), Bankim Chandra Chatterjee: Essays in Perspective, Sahitya Akademi, Delhi, 1994, p. 577.Bankim remained an anglophile and used to say that Indians have no enmity with the British and the British Race hasbeen great benefactor of Indians. [iii] Arabinda Das, Abbey of Delight [English translation of Bankim Chander Chatterjee’s Anandmath in Bengali] (Kolkata: Bandna Das, 2000), 111–112. [viii] Sen-gupta, Nares Chandra (translator Bankim Chandra Chatterjee’s Anandmath), Abbey of Bliss, Padmini Mohan Neogi, Calcutta, nd, pp. vii-viii.